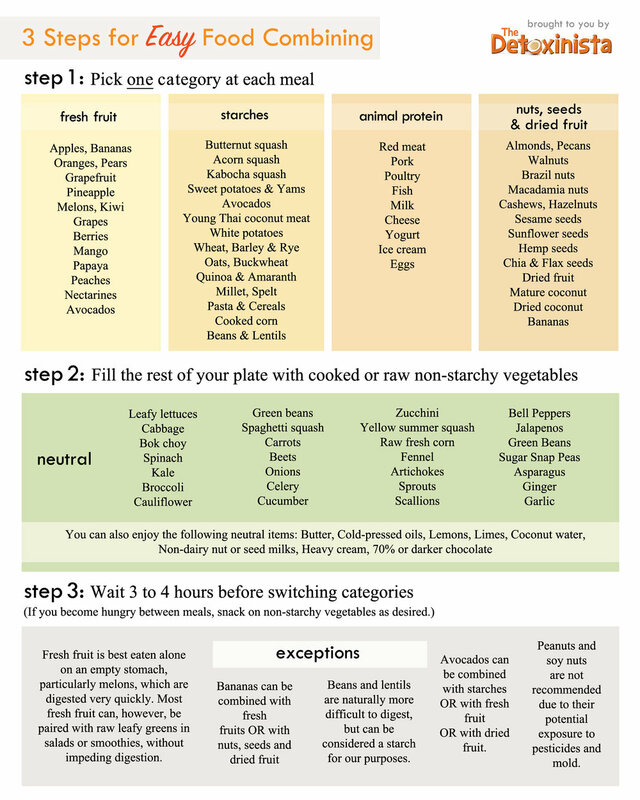 So today I want to share something that I’ve been using for a while to help keep my digestion 100: FOOD COMBINING. Let’s backtrack a second and talk about digestion. Did you know that digesting food takes more energy than any other function for our body? Think about how tired you get after a big lunch? That’s all your energy going to digest all that (usually miscombined) food. We want our digestion to be going as smooth and efficient as possible so we can feel the best we can . Basically food combining is keeping our meals simple and eating foods that digest together optimally. Some food when eaten with other food digests at different speeds and can cause bloating, gas, and take a super long time (and a lot of energy) to digest. I look at food combining as suggestions, not hard fast rules to stress you out. I know it can sound a little overwhelming and confusing at first but once you get the hang out it, it becomes second nature. I try to follow this about 80 percent of the time. I feel so good when I do, but if I’m traveling or getting dinner with friends I’m not gonna stress about it. Fruit should be eaten first thing in the morning, on an empty stomach or at least 3-4 hours after your last meal. Fruit digests super quickly (around 30 minutes) and if you eat it after a big meal, it just sits on top of the slower digesting food, fermenting and causing gas and bloat. Never eat fruit as a dessert. Don’t combine starch and proteins. Pick one or the other for each meal. Starches include: Beans, potatoes, grains, sweet potatoes, lentils. Protein include: Nuts, seeds, tofu, animal protein, dairy products, eggs, fish. Vegetables are considered neutral and can be eaten with either starches or protein. They also work with fruit when blended (like in a smoothie). Avocados are also considered neutral foods. They work with anything. Eat a small salad before each meal to get your digestion going. I love this because GREENS ARE GOOD FOR YOU and it gives me a chance to sneak some more greens into my diet. If I don’t have time to make a salad I liketo munch on some celery sticks while cooking. I found a really good chart breaking everything down on detoxinista.com. I don’t know about you but I’m more of a visual person and this definitely helped me. When you wake up: Big glass of warm or room temperature water with lemon and a probiotic. I chug a huge Weck Jar of lemon water every morning (sometimes I throw a pinch of pink salt in it). It really gets things going if ya catch my drift. Breakfast: fruit with some coconut yogurt, a cauliflower smoothie, or a Glowing Green Smoothie. Lunch: a leafy green salad (I’m a big fan of arugula) with sauerkraut as a dressing, avocado, and veggies with some nutritional yeast and Frank’s Hot Sauce. Dinner: a small salad before dinner then some roasted veggies and a plant based protein, usually BBQ tempeh. I try not to snack in between meals to let everything fully digest. I always check: am I really hungry? Am I thirsty? Am I bored? And if I’m actually hungry I’ll grab a snack like a banana, seaweed snacks, celery and salsa, etc. Optimal digestion is important, but I’m not gonna go around hungry. BEAUTY DETOX SOLUTION - The book that started everything for me! This is a super informative article on mindbodygreen. Let me know in the comments if you have any questions in the comments!